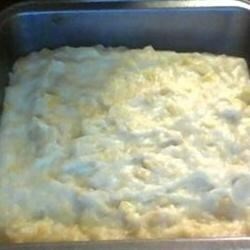 "A simple and delicious dessert of corn pudding made with canned cream of corn and rice flour. Serve with Latik (Fried Coconut Milk Curd) for a true Filipino experience." Mix thoroughly the coconut milk, cream-style corn, rice flour, and sugar in a non-stick pot over medium heat. Stir frequently while cooking until thick, about 30 minutes. Pour into a serving platter with ridges, or a tray, and let cool completely before serving. Versatile, comforting cheesy corn side. Garnish your Maja Blanca Maiz with Latik (Fried Coconut Milk Curd) for an authentic Filipino treat. I made this dish for my mother and she tells me to make it for her all the time since it reminds her of her childhood. Great recipe! Very tasty. Felt it took under 30 minutes (thickened quickly for me). Yum. Thanks!